Below are some requirements and testing the West German Shepherds are required to pass before they are ready to breed. This will give you a detailed explanation of German Terminology you will see on the pedigrees of Kappel Kennel German Shepherd Dogs. 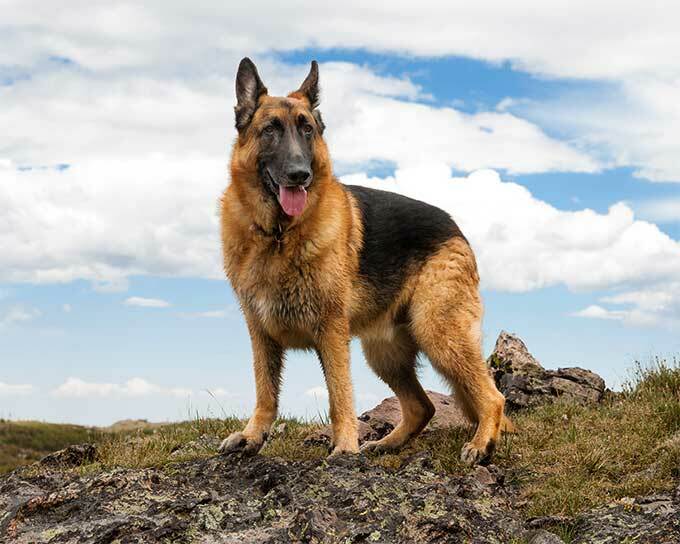 There are many words, abbreviations, ratings and titles that are used throughout many of the pedigrees of our German Shepherd Dogs. For better understanding we will give a brief description of the common terminology used. For this rating the dog must compete for titles in Germany or other countries under the rules of the SV (Verein fur Deutsche Schaferhunde, the club for German Shepherd Dogs in Germany). To meet this world standard each dog must pass a companion dog temperament test (BH), a minimum of a SchH1/IPO1 working degree, certified hips ("a" stamp or OFA) a 12 mile endurance test followed by an examination for physical soundness. The dog must also compete at a show to achieve a conformation rating of at least a SG or better. These requirements make the dog eligible to enter a Koerung/ Breed Survey (qualify for breeding). At the Breed Survey the dog is carefully evaluated for correct structure, temperament and courage. These requirements are only guidelines for our breed, sometimes recommendations are given to who the dog should be bred with to produce excellent offspring, also sometimes certain bloodlines are not bred together as the two bloodlines do not work well together. Breed Value Assessment Number The best tool for breeders in the fight against canine hip dysplasia (CHD), to come along in years, is the SV's HD Zuchtwert, or Breed value assessment number (HD ZW). The HD ZW number is an estimation of the probability that a dog will produce progeny with CHD. The HD ZW value factors in many variables in the calculation, but is based mostly on the hip status of a dog's progeny. This is the critical factor in the usefulness of the HD ZW. The dog's own hip status is only one of several important variables in the equation, not the sole determinant. This is because it is possible for a dog with excellent hip status to produce a majority of progeny with CHD. And conversely, a dog with Fair hip status can produce a majority of progeny with excellent hip status. Without factoring in this critical look at the dog's Genotype (what his genes pass on to progeny) in addition to his Phenotype, (what his actual hip status is) real progress can not be made in reducing the incidence of CHD. o how does it work? Each dog registered with the SV is assigned an HD ZW number at birth, based on its Parents HD ZW numbers. After a dog is x-rayed, its own hip status is factored into his HD ZW. Upon producing progeny of his own, the results of the progeny's x-rays are then factored into the parents HD ZW numbers. The HD ZW number is not a static value. It fluctuates depending on what the dog produces! This is what is important: A dog's Genotype; What the dog produces. Not his Phenotype; what his actual hip status is. For breeders in the US, you must register your dog with the SV or USA/SV, and have the dog's x-ray evaluated by the SV for 'a' stamp. This also settles the PennHIP vs. OFA vs. 'a' stamp question. The diagnostic method to determine a dog's hip status is not relevant. The most relevant data comes from a dog's actual production, "Do his progeny have CHD or not." Siegerin Same as for Sieger but applies to the females in each class.